Wobbling around the rink with stiff ankles and tensed shoulders must have appeared to be a new experience for me, but I had been struggling to master roller skating for months. It looked like so much fun, and others made it seem simple. Small children zoomed past me like pros. My companions glided with ease, bouncing to the rhythm of the latest snappy tunes. Though I laughed at myself, I envied them. When frustrated with my lack of progress, I would sit and watch others until the evening ended. C-R-A-S-H! I plunged to the ground obediently. “Ha-ha-ha-ha!” he chuckled afterwards. Initially, I laughed with him. Then he persisted in an inconsiderate game for which I became his voice-controlled pawn. “F-A-L-L!” he yelled each time I approached the curve. “P-L-O-P!” On the floor I crashed again and again and again. I failed to see the humor after the fourth or fifth time. I admit that I was a tad angry and frustrated at that boy. A proficient roller skater I would never become. That night I decided to end my skating career before I broke any bones or caused a permanent disability. I left the rink without acheiving my goal, but not without learning from my experience. Just like that mischievous boy, the devil finds pleasure in my defeat. He lurks on the sidelines, jeering whenever I stumble and fall. He’s thrilled when I become discouraged while lingering on the brink of quitting. I’m learning to stand and praise God during adversities. Life without failure would be nice, but is not possible in this sin-infected world. Sometimes I fall—that’s not important—what’s important is how many times I am willing to get up and try again and again and again, leaning on the strength of Jesus. That is what determines my success. In Isaiah 60:1 we read, “Arise; shine; For your light has come! And the glory of the LORD is risen upon you” (NKJV). In the light of God’s glory and grace, I can always find strength to rise again. When I was a young girl, I enjoyed coloring. There was something special about opening up a new box of crayons and finding a fresh coloring book waiting for me. Sometimes I strived to stay inside the lines; other times I didn’t worry about them as I scribbled and used odd colors, making dogs green or cows purple. Sometimes I would get bored with the picture I was coloring and move on to something else before finishing it. I never thought much about the way I was coloring. I just enjoyed doing it. When my children were old enough to have crayons, I noticed that they stayed away from pictures that required them to follow a color chart. They, too, preferred the freedom of choosing their own way. These simple rules about coloring can apply to my life. Opening up a box of crayons is like starting a new day. Just as one has to choose which crayon colors to use, I am faced with choices throughout the day. Will I scribble away my time, thoughts, and energy, following my own path, or will I follow God’s design, staying within the boundaries He has set for me? Unfortunately, my life has had darkly colored times when I chose not to live according to the directions God gave. But when I yielded to God’s plan, He made beauty out of the coloring mess I’d made in my life. He shaded over my mistakes with a red crayon, Christ’s blood, creating a clean new page that He and I together are filling with vibrant colors. Now I try not to pick my “life crayons” out according to how I feel at the moment. Instead I pay attention to the color chart God gave me in His Word, and I pray for His help as I strive to stay within the lines He has established for me. Martha J. Willey is a freelance writer from Northwood, Ohio. As we go about our daily activities, we encounter a multitude of everyday signs that supply us with various kinds of information. These signs provide directions (“Historical Landmark Ahead”), note activities (“Garage Sale”), cite locations (“Quiet Zone”), and give safety tips (“Steep Hill”). DEAD END: Irritated that the road ran out on you? Is your life at a similar dead end? Perhaps you need a change of direction. GARAGE SALE: Is your mind in need of a similar cleaning out? Remove the clutter from your mind. Forgetting the trivial will leave time for important thoughts. HANDLE WITH CARE: People and friendships are like fragile packages—they need special handling. Take extra time today to be sensitive to another’s needs. HELP WANTED: Are you so busy that you sometimes don’t see subtle signs of need, such as a look in the eye, an indirect reply? Take more time with a friend, and make that person’s needs your priority. HISTORICAL LANDMARK AHEAD: Do special times and places remind you of historical landmarks in your life? Reflect on these markers from time to time. Perhaps by knowing where you’ve been, you’ll be better prepared to know where you’re going. PROCEED WITH CAUTION: Do you sometimes do things too hastily and later regret your actions? Maybe remembering such experiences can help you slow down and take more care in the future. QUIET ZONE: Do you long for a quiet zone in your busy daily schedule? Perhaps a brief period of quiet rest each day is just what you need. SPEED LIMIT: Stop rushing! Take time to calm down and relax. Put a speed limit on your daily pace of activities. Think through things and make a plan. Do things with conscious deliberation. STEEP HILL: Do some parts of your life seem to be getting out of control? Gear down and brake. Recognize your need to change or curb your actions. BIKE PATH: A bike path provides a place for solitude, where one can gain new awareness, relaxation, and revival of spirit. Make a place in your life for solitude now and then. STOP: The mandatory stop signs you encounter while driving regulate traffic. Use occasional unscheduled stops in your busy day to redirect your thoughts to God. WINDING ROAD: With all the bends and turns life takes, remember that the Holy Spirit is your best guide. When you encounter other informative everyday signs, reflect on their deeper meanings. Consider, for example, what awareness of a DETOUR sign could mean for your future. Could it direct you to lead a fuller life? As you look at the signs, just imagine the possibilities! Annie Laura Smith is the editor of the 50 year history, We Are Called, of Trinity United Methodist Church in Huntsville, Alabama, and the author of a World War II trilogy, The Legacy of Bletchley Park, Will Paris Burn? and Saving da Vinci, for young readers. During a recent trip to Maui, I walked across the street from our motel. As I breathed in the ocean air and gazed at the sights around me, I suddenly looked down and noticed a pair of sandals resting in the dark red, powdery dirt. Above them stood a monument, a shrine dedicated to the lost, extinct island of Moku’ula, a place where some believe royalty and the gods assemble and kings are nurtured. I don’t know if the owner of the sandals merely forgot them or decided to leave them in honor of the many Hawaiian gods, but if he were here I would tell him about another episode in history where someone abandoned his sandals in reverence to deity. Only this Deity was not one of many false gods. He was the one and only true God. At God’s command, Moses abandoned his sandals in honor of the holy ground on which he stood. He demonstrated humility by this simple act as God instructed him to deliver His people from the hand of Pharaoh. On an ordinary day, God invaded one man’s life with possibility. In spite of Moses’ uncertainty and awkward speech, God used him to accomplish a plan that exalted Moses to the great Hall of Faith described in Hebrews 11. Can God use me? Can God use you? When we abandon our sandals, humbling ourselves before God and releasing our wills to allow Him to wield His extraordinary hand in our ordinary circumstances, He can do mighty things through us. What an overwhelming thought! Nothing else brings deep satisfaction like knowing we are accomplishing God’s purposes. Eileen Rife is a speaker and author of several books. You may visit her website at http://www.eileenrife.com. As we consider the Resurrection of our Lord Jesus Christ, let us recall His example. “Let us fix our eyes on Jesus, the author and perfecter of our faith, who for the joy set before him endured the cross, scorning its shame, and sat down at the right hand of the throne of God” (Hebrews 12:2 NIV). Let’s stay the course, no matter how many falls we might take, or how many detours, steep hills, or stops might try to deter us, and no matter the labyrinth we seem to be navigating. As we depend on God’s strength, we can reach whatever goals He has set for us. In the next few weeks, do as Annie Laura Smith suggests. Look for signs—road signs, advertising, or any other written directions you can find. Then think about how they might direct you to a better and closer walk with God. Remember that the most reliable signpost is the Word of God, the Bible. Read it everyday, and you’ll have God’s own directions for staying the course and finishing well. My three-year-old son, Aiden, got a new bicycle for Christmas last year. It is small and has training wheels. Aiden was excited to go out for a ride that afternoon. He took to it very quickly and soon was pedaling up and down the sidewalk. Our driveway has a substantial incline, so it was difficult for him to get to the top without a good start. Aiden was having trouble and decided to make a course change for the sidewalk. My son failed to take the curb into account and the bicycle fell over, spilling him onto the grass. I watched carefully at this point, wondering how he would react. I half-expected him to cry and want to take a break from riding. To my surprise, he jumped right back up without a single sound, immediately got back on the bicycle, and happily rode down the sidewalk. I admired him for how he handled himself. I started thinking about his reaction and took a look at how I react to my own adversities. We all fall down at some point. The question is, how do we respond? Do we throw in the towel and give ourselves over to self-pity? Or do we pray for strength, get up, and keep going? May we continue to run the race with endurance. With strong determination, Cole stole the ball and raced down the soccer field. His ball control was flawless as he deftly avoided all opposition. He turned on the jets and quickly left the rest of the four-year-olds behind. He was intent on his target. He stopped just shy of the goal and unleashed a mighty kick. The ball soared and found the back of the net . . . of the wrong goal. Sitting in the stands watching, I had to laugh and shake my head. It occurred to me that I, too, frequently race toward the wrong goal. If I do things well in my life but go in a different direction from where God is leading me, then I’m still not successful. Ephesians 5:17 tells us, “Therefore do not be foolish, but understand what the Lord’s will is” (NIV). When we follow the plan that God has laid out for us, our chances of success are greatly increased and we will find the peace that He has in store for us. Craig Campbell is a freelance writer from Grapevine, Texas. unending, unasked for, undeserved mercy and love. LaVeena Crow is a feelance writer from Greentown, Indiana. Susan Joy Clark is a freelance writer from Verona, New Jersey. She enjoys singing in her church choir and working with teens and children in a church puppet ministry. She is the author of And the Violin Cried. As you seek to stay the course and press on to the finish line, Donkeys Still Talk will be a worthwhile companion to take along on the journey. 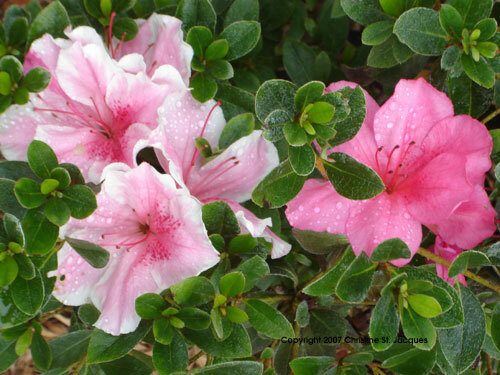 “Dew-kissed Azaleas” is our cover photo, taken by freelance writer, editor, and photographer Christine St. Jacques. Fresh blossoms in springtime remind us that no matter how difficult the winter of our circumstances, no matter how often we fail, we can rise to renewed faith and determination, because Jesus, God in human flesh, overcame sin and human failings by giving His life for ours. When He did, He provided us an example as He opened the way—the only way—to eternal life.